Abiding in Christ is holding steady in the presence of Christ trusting his promises by faith irrespective of the challenges, trials, and tribulations of our lives. Remaining in faith and looking to Christ to be our sufficiency in the midst of our inadequacies keeps us in his constant, conscious presence. Only by abiding can our ministry efforts have outcomes that will last for eternity. To abide in Jesus is never to quit Him for another love or another object, but to remain in living, loving, conscious, willing union with Him. The branch is not only ever near the stem but ever receiving life and fruitfulness from it. All true believers abide in Christ in a sense; but there is a higher meaning, and this we must know before we can gain unlimited power at the throne. C. H. Spurgeon, Cheque Book of the Bank of Faith: Daily Readings (Geanies House, Tain, Ross-Shire, Great Britain: Christian Focus Publications, 1996), 54. When our Lord says: ‘Abide in me, and I in you,’ He points to something analogous to this. ‘Abide in me’: that refers more to that which we have to do. We have to trust and obey, to detach ourselves from all else, to reach out after Him and cling to Him, to sink ourselves into Him. As we do this, through the grace He gives, a character is formed, and a heart prepared for the fuller experience: ‘I in you,’ God strengthens us with might by the Spirit in the inner man, and Christ dwells in the heart by faith. Andrew Murray, The True Vine (Chicago: Moody Press, n.d.), 35. This entry was posted in Abiding in Christ, Andrew Murray, Charles Spurgeon and tagged Abiding in Christ, Andrew Murray, Charles Spurgeon on August 17, 2012 by GlennDavis. Duh, Christianity is a person–that is obvious! Or is it? How often we forget that Christianity is about a love relationship with Jesus. We get involved in every discussion of liturgy, theology, and ethics, but we forget that Christianity is about being in love with Jesus. Liturgy, theology, and ethics are valuable in their own right, but they cannot be a substitute for an experiential love relationship with Jesus. But what are your doctrines?’ ‘There they stand incarnate.’ ‘But what is your practice?’ ‘There stands our practice. He is our example.’ ‘What then do you believe?’ Hear the glorious answer of the Apostle Paul, ‘We preach Christ crucified.’ Our creed, our body of divinity, our whole theology is summed up in the person of Christ Jesus. This entry was posted in Charles Spurgeon, Jesus Christ and tagged Charles Spurgeon, Jesus Christ on August 11, 2012 by GlennDavis. Life takes its toil: loss of a loved one, chronic pain and sickness, broken relationships, and financial struggles. Yet during all this confusion, hurt, and disappointment, every believer has the balm of Gilead, the healer of our souls: Jesus Christ. In prayer and worship, the Holy Spirit comes and makes Christ known to us in all his grace and glory. Jesus Christ loves, heals, soothes, and renews us in the midst of the toils and struggles of this life. Jesus’ cross carries our sorrows, his resurrection lifts up out of the pit, and the Spirit’s presence takes away our loneliness. Oh, there is, in contemplating Christ, a balm for every wound; in musing on the Father, there is a quietus for every grief; and in the influence of the Holy Ghost, there is a balsam for every sore. Would you lose yourself in sorrow? Would you drown in your cares? Then go plunge yourself in the Godhead’s deepest sea; be lost in His immensity; and you shall come forth as from the couch of rest, refreshed and invigorated. I know nothing which can so comfort the soul; so calm the billowing of sorrow and grief; so speak peace to the winds of trial, as a devout musing upon the subject of the Godhead. Charles Spurgeon, “The Immutability of God,” January 7, 1855, quoted in J. I. Packer, Knowing God (Downers Grove, IL: InterVarsity Press, 1973), 14. This entry was posted in Charles Spurgeon, Jesus Christ and tagged Charles Spurgeon, Jesus Christ on July 4, 2012 by GlennDavis. To each is given the manifestation of the Spirit for the common good. For to one is given through the Spirit the utterance (i.e., word) of wisdom, and to another the utterance (i.e., word) of knowledge according to the same Spirit. A word of knowledge is insight given to a believer into another person’s past which ministers God’s present love into their current problems and struggles. A word of knowledge reveals heart-felt secrets that only our omniscient God could know for the purpose of displaying God’s care and concern for that person’s needs. “A word of knowledge is usually defined within charismatic circles as the report of a specific piece of information that a person could not possibly have known naturally” (Adrian Warnock). Charles H. Spurgeon, The Autobiography of Charles H. Spurgeon, Vol. 2: 1854-1860 (Philadelphia: American Baptist Publication Society, 1899), 226-227. This entry was posted in Charles Spurgeon, Spiritual Gifts and tagged Charles Spurgeon, Spiritual Gifts, Word of Knowledge on October 5, 2011 by GlennDavis. I have been a Bible-believing Christian since 1976 and I have heard many, many sermons. Some of those sermons were memorable, some were challenging, some were convicting, and some were forgettable. The common denominator between the life-changing sermons and the God exalting ones were Jesus Christ. The preachers proclaimed Jesus Christ: his person, his work, his grace, his cross, and his love. A sermon without Christ is moralism: a sermon proclaiming Christ is the gospel. Charles H. Spurgeon,“To You,” No. 2899, A Sermon Published on Thursday, September 1st, 1904, Preached at the Metropolitan Tabernacle, Newington, on Lord’s-Day Evening, July 9th, 1876. Charles H.Spurgeon, Spurgeon’s Sermons: Volume 50, electronic ed. (Albany, OR : Ages Software, 1998). This entry was posted in Charles Spurgeon, Preaching and tagged Charles Spurgeon, Jesus Christ, Preaching on July 10, 2011 by GlennDavis. The Bible explicates the Cross in terms of images. Images of salvation (not theories), are concrete pictures of the work of the Cross drawn from the everyday life of the first century. They are not usually abstract concepts, but cogent pictures of God’s redeeming love. These images are complementary to one another, each truth paints a piece in the mosaic of God’s saving grace. As for the imagery, “propitiation,” describes a sacrificial offering that turns away the wrath of God against sin. “Redemption,” pictures a transaction in a market-place where we are bought back from slavery (to sin). “Justification,” pronounces our acquittal in the heavenly law court. “Reconciliation,” describes the end of hostilities in our relationship with God. “Adoption,” grants us the legal status of a son of God and an heir of the kingdom. 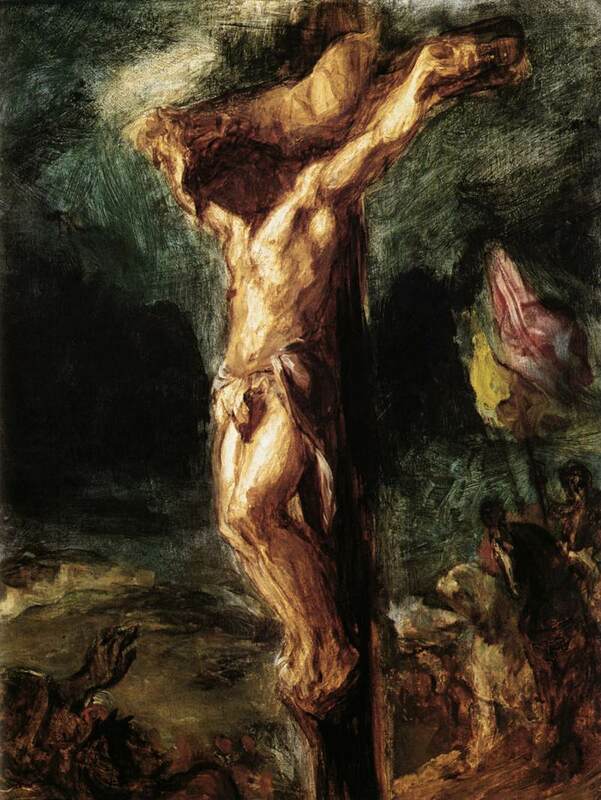 “Substitution,” grounds the rest of the images, for Christ took upon himself our punishment, guilt, and shame. Jesus Christ must die in our place and suffer our just punishment; otherwise, propitiation, redemption, justification, reconciliation and adoption have no meaning. The Cross of Christ on one hand is inexplicable, therefore a deep and great mystery. On the other hand, scripture does give us images that we can grasp and hold dear knowing that our Savior has made the way for us to be right with God. This darkness tells us all that the Passion is a great mystery into which we cannot pry. I try to explain it as substitution and I feel that where the language of Scripture is explicit, I may and must be explicit, too. But yet I feel that the idea of substitution does not cover the whole of the matter and that no human conception can completely grasp the whole of the dread mystery. It was worked in darkness because the full, far-reaching meaning and result cannot be beheld of finite mind. Tell me the death of the Lord Jesus was a grand example of self-sacrifice—I can see that and much more. Tell me it was a wondrous obedience to the will of God—I can see that and much more. Tell me it was the bearing of what ought to have been borne by myriads of sinners of the human race, as the chastisement of their sin—I can see that and found my best hope upon it. But do not tell me that this is all that is in the Cross! No, great as this would be, there is much more in our Redeemer’s death. . . . God veiled the Cross in darkness—and in darkness much of its deeper meaning lies—not because God would not reveal it, but because we have not capacity enough to discern it all! Charles H. Spurgeon, “The Three Hours of Darkness,” No. 1896, A Sermon Delivered on Lord’s Day Morning, April 18, at the Metropolitan Tabernacle. This entry was posted in Charles Spurgeon, The Cross and tagged Charles Spurgeon, The Cross on June 28, 2011 by GlennDavis. The Baptism of the Holy Spirit is an overwhelming experience of the Spirit’s presence, power, and purity: a total submergence within the person of the Holy Spirit. This individual God-encounter is instantaneous and reoccurring: one baptism, many fillings. The Baptism of the Spirit refers to the initial work of the Spirit in uniting believers to Christ as well as on-going encounters with the Spirit bringing refreshment, renewal, and endurance to the Christian’s life. No matter what level of spiritual maturity we are on, we need renewed appearances, fresh manifestations, new visitations from on high. While it is right to thank God for the past and look back with joy to His visits to you in your early days as a believer, I encourage you to seek God for special visitations of His presence. I do not mean to minimize our daily walk in the light of His countenance, but consider that though the ocean has its high tides twice every day, yet it also has its spring tides. The sun shines whether we see it or not, even through our winter’s fog, and yet it has its summer brightness. If we walk with God constantly, there are special seasons when He opens the very secret of His heart to us and manifests Himself to us – not only as He does not to the world but also as He does not at all times to His own favored ones. Not every day in a palace is a banqueting day, and not all days with God are so clear and glorious as certain special sabbaths of the soul in which the Lord unveils His glory. Happy are we if we have once beheld His face, but happier still if He comes to us again in the fullness of favor. C.H. Spurgeon, “Essential Points in Prayer,” in The Power of Prayer in a Believer’s Life, ed., Robert Hall (Emerald Books, 1993), 136. This entry was posted in Charles Spurgeon, Holy Spirit and tagged Baptism of the Holy Spirit, Charles Spurgeon on September 30, 2010 by GlennDavis. Several years ago, I was on a sabbatical and visited several different churches over a six week period in order to get a sense of the local preaching. I was dismayed and baffled by what I heard. Conservative, Evangelical churches that taught eight steps to happiness, six ways to be free from anxiety, America is a Christian nation, etc. Not a single sermon I heard mentioned the Cross, grace, or the Holy Spirit. How can you have a New Testament sermon without Christ, the Cross, and the Holy Spirit? The sermons I heard were try harder, do better sermons, not gospel infused messages that are Christ exalting, Christ glorifying, and Holy Spirit transforming. First Corinthians 1:30 states that Christ is our wisdom, righteousness, holiness, and redemption. Wisdom is the practical application of Jesus in the midst of life’s difficult choices, complicated situations, and perplexing people. Wisdom is making the right choices leading to right actions that lead people to do the right thing. Good preaching must communicate Jesus because only in him can we apply biblical truths to everyday life experiences. Jesus is wisdom-the gospel applied to life (Col. 2:2-3). Jesus is our righteousness for a guilty past, Jesus is our sanctification for a triumphant present, and Jesus is our redemption for a certain future in God’s kingdom (1 Cor. 1:30). This entry was posted in Charles Spurgeon, My Sermons, Preaching, The Cross and tagged Charles Spurgeon, Preaching, The Cross on August 12, 2010 by GlennDavis. Pastor Charles H. Spurgeon revels in the incarnation. Spurgeon’s text is Isaiah 9:6 . As Jesus Christ is a child in his human nature, he is born, begotten of the Holy Ghost, born of the Virgin Mary. He is as truly-born, as certainly a child, as any other man that ever lived upon the face of the earth. He is thus in his humanity a child born. But as Jesus Christ is God’s Son, he is not born; but given, begotten of his Father from before all worlds, begotten—not made, being of the same substance with the Father. The doctrine of the eternal affiliation of Christ is to be received as an undoubted truth of our holy religion. But as to any explanation of it, no man should venture thereon, for it remaineth among the deep things of God—one of those solemn mysteries indeed, into which the angels dare not look, nor do they desire to pry into it—a mystery which we must not attempt to fathom, for it is utterly beyond the grasp of any finite being. As well might a gnat seek to drink in the ocean, as a finite creature to comprehend the Eternal God. A God whom we could understand would be no God. If we could grasp him he could not be infinite: if we could understand him, then were he not divine. This entry was posted in Charles Spurgeon, Christmas and tagged Charles Spurgeon, Christmas on December 25, 2009 by GlennDavis.